Globally, natural resources are increasingly under pressure, especially due to population growth, economic growth and transformation as well as climate change. As a result, the water, energy, and food (WEF) nexus approach has emerged to understand interdependencies and commonly manage resources within a multi-scale and multi-level framework. In Sub-Saharan Africa, the high and growing consumption of traditional biomass for cooking purposes - notably fuelwood and charcoal—is both a key source of energy and contributor for food security as well as a pressure on natural resources. Improving the bioenergy value chains is essential for limiting environmental degradation and for securing the livelihoods of millions of people. Although the WEF nexus approach entails large potential to address the complex problems arising along the bioenergy value chains, these are currently not considered. Based on the WEF nexus approach, we analyze the different steps within the charcoal value chain in Sub-Saharan Africa and highlight the respective interdependencies and the potential for improving overall socio-economic and environmental sustainability. We emphasize the water, energy and food related implications of vicious and virtuous production cycles, separated by value chain segments. We discuss the potential and major challenges for implementing more sustainable value chains. Furthermore, we underline the necessity of applying WEF nexus approaches to these value chains in order to optimize environmental and social outcomes. Since 1980, the planet has lost about 50% of its biodiversity (WWF, 2016), with 33% of land moderately to highly degraded (FAO, 2015) and water resources overexploited in more than 30 countries (UNEP, 2008). Pressure on these natural resources rises with rising populations and demand for various natural-resource-dependant products. Global demand for water (Foresight, 2011), energy (IEA, 2013), and food (FAO, 2009) is expected to increase between 60 and 85% in the coming decades, especially in fast growing, underdeveloped countries. Developments for these resources and the linked sectors are intimately interwoven. In response, the WEF (Water, Energy, Food) nexus approach has emerged as a concept for the analysis and management of the complex global resource systems (World Economic Forum, 2011; FAO, 2014; Yumkella and Yillia, 2015). It acknowledges that the joint understanding and sustainable management of water, energy, and food is critical for maintaining the provision of ecosystem services and thus achieving livelihood security (Beisheim, 2013; Schomers and Matzdorf, 2013; Spiegelberg et al., 2015). Therefore, the WEF nexus approach is multi-dimensional, integrating management and governance systems across sectors and scales (Hoff, 2011). Overcoming silo thinking (Hussey and Pittock, 2012; Rasul, 2016) is its main aim (FAO, 2014) and cross-sectoral linkages, costs and benefits are therefore an integral analytical focus (Ringler et al., 2013; Semertzidis, 2015). Hoff (2011) outlines the three central guiding principles as (1) investing to sustain ecosystem services; (2) creating more with less; and (3) accelerating access and integrating the poorest. With this article we argue that the WEF nexus approach is an especially well suited concept for tackling a major and strongly disputed economic, social, and environmental issue in SSA: charcoal production. With a WEF perspective, we look at the entire charcoal value chain and summarize the socio-economic and environmental issues and potential technical, political, and institutional solutions. Through this integrated approach, we link an old issue to a variety of new international developments, including the ecosystem service concept, new food security approaches, the bio-economy move and the SDGs, which start to trigger a host of new national policies and funding initiatives. Charcoal plays an extremely large but often overlooked role in many developing countries. Food security for up to three billion individuals (Jagger and Shively, 2014; Urmee and Gyamfi, 2014) depends on bioenergy for cooking (Makungwa et al., 2013), with wood based bioenergy accounting for roughly 10% of global primary energy (Bailis et al., 2015). In SSA, up to 90% of the primary energy consumption are based on wood (Sosovele, 2010), representing up to 3% of national GDP, with charcoal being the preferred choice of urban households (Santos et al., 2017). For Dar es Salaam for instance, it is calculated that a 1% increase in urbanization leads to a 14% increase in charcoal demand (Hosier et al., 1993). Although rather old, this figure is substantiated by the reported growth of charcoal consumption in Tanzania as published by Peter and Sander (2009) (one million tons in 2009) and CAMCO (2014) (2.3 million tons in 2012). In SSA in total, the charcoal value chain employs up to 13 million people (Openshaw, 2010) and generates $8 billion in economic activity annually (UNCCD, 2015). The discussion whether and to which extent charcoal production contributes to deforestation and forest degradation (DFD) (Butz, 2013; Chidumayo et al., 2013; Sander et al., 2013; Schure et al., 2013; Zulu and Richardson, 2013; Smith et al., 2015; Ndegwa et al., 2016) or not (Minten et al., 2013; Mwampamba et al., 2013; Owen et al., 2013) is ongoing. In a recent meta-study FAO (2017) summarizes that “where demand is high, mainly in [SSA] […], unsustainable wood harvesting and charcoal production contribute to forest degradation and deforestation […]” (p. 2). We follow this assessment and include this negative consequence in our analysis even though context specificity remains essential. Nevertheless: Politically, claimed DFD remains an important argument against constructive charcoal policies and projects. The importance of the value chain is overlooked, neglected, or evaded by national governments (Doggart and Meshack, 2017), donors and implementing agencies (Kees and Feldmann, 2011). If at all, usually only partial attempts were made to intervene into the charcoal value chain, often with a biased attitude toward it. Prominent examples include efforts to plant wood lots as a substitute for forest harvesting (Chamshama et al., 2010), to improve the efficiency of cooking (Hanna et al., 2012), to regulate the sector with central government control (Schure et al., 2013), and to substitute wood energy (Bazilian et al., 2011). However, many of these efforts were relatively unsuccessful, and most were insufficient to change the negative public image of charcoal. But given its huge present and future importance, renewed efforts to improving this value chain are imperative if not only minor energy and resource challenges but arguably one of the largest WEF ones is to be tackled. This perspective article argues that it is urgent to anew tackle the charcoal issue as one of the key challenges for energy, food, and water security in SSA. The WEF nexus approach applied to the charcoal value chain resumes not only its problems but also its strengths and positive provisions. The wider ecosystem services approach looks beyond WEF and also takes on board other services of trees and forests such as biodiversity and climate regulation. We want to demonstrate that these new concepts are especially well-suited to address and overcome existing multi-dimensional challenges and to support the development of sustainable charcoal value chains. This new perspective is argued to accommodate recent political multi-dimensional initiatives, notably the Agenda 2030. However, traditional bioenergy including charcoal does not play a role in WEF nexus and ecosystem services approaches yet and we therefore urge researchers and policy makers to apply them to charcoal value chains on all scales to close this gap and therewith help to solve challenges that have been present for many decades. In sum, we aim to implement a paradigm shift toward joint research and political action between ministries, programs, and policies. The analysis is based on a literature review. WEF nexus aspects and dimensions of sustainability along the charcoal value chain in SSA are analyzed and discussed as outlined in Figure 1. Major analytical trajectories are separated into (Figure 1A) socio-economic and (Figure 1B) environmental spheres. Figure 1. 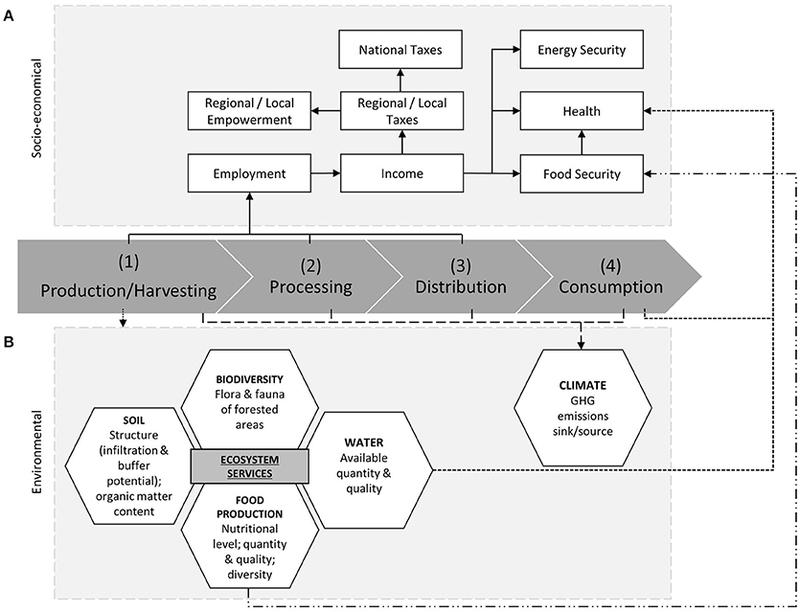 Analytical framework for charcoal value chain assessment with focus on sustainability dimensions (A: socio-economical; B: environmental) and WEF nexus analysis (adapted from Peter and Sander, 2009). Charcoal in SSA is mainly produced via informal/illegal extraction and carbonization of wood resources from forested areas (Kwarteng, 2015; FAO, 2017) although the role of trees outside forests remains unclear (Neufeldt et al., 2015). Wood cutting for charcoal is commonly associated with DFD (Figure 1B) even though this effect is questioned by researchers. In the prevailing charcoal production system, the harvesting of wood resources occurs in close proximity to the kiln (Luoga et al., 2000), thus resulting in potentially harmful effects being local. As larger log pieces are preferred for charcoal production, the composition of age classes in the affected forested areas shifts toward smaller and younger trees. Selective tree cutting also occurs as some tree species are better suited for charcoal production than others (Ndegwa et al., 2016). These processes result in reduced biodiversity and lowered biomass input into soils. There are potentially further negative consequences for water quality and quantity (Lele, 2009) and biota and bioturbation, leading to poorer soil quality. Consequently, soil erosion takes place (Zimmermann et al., 2006; Mohammad and Adam, 2010) which might also affect crop production negatively. In the prevailing—potentially extractive—system of charcoal production, neither reforestation nor afforestation occurs; thus neither relevant job opportunities nor downstream effects are created (Figure 1A). Due to the de facto unregulated character of charcoal production in most SSA countries, negligible taxes are paid and the governments do not receive any revenues. However, food security is increased temporarily as overall household income rises. Positive environmental effects are also widely absent (Figure 1B). Sustainable management of (natural) forests or the implementation of locally adapted agro-forestry systems is more positive as biodiversity and water flows are largely maintained. However, the implementation of joint food/wood production in locally adapted agroforestry systems is critical for long-term success, especially when focusing on the WEF nexus—even though the adaptation of sustainable agroforestry systems is already challenging (Pollini, 2009; Jerneck and Olsson, 2013). A careful implementation of agroforestry systems could also create rural job opportunities, with higher and more diversified incomes Leakey (2014) (Figure 1A). On the environmental side (Figure 1B), agroforestry systems can improve local soil and water quality, the available water quantity, biodiversity in the agroforestry landscapes and food production (Sanchez, 2002, 2010; Mugo and Ong, 2006). Charcoal production represents a significant transfer of financial resources from urban to rural areas and is perceived as an “engine of economic growth” (p. 297) from Van Der Plas and Abdel-Hamid (2005). Thus, sustainable charcoal production can be understood as a pro-poor development measure because it increasing and stabilizing incomes, especially in rural areas (Ahrends et al., 2010; Figure 1A). Currently, carbonization mainly takes place in traditional earth mound kilns with low conversion efficiencies (e.g., Tabuti et al., 2003; Peter and Sander, 2009). This low conversion factor is due to insufficient drying of wood, non-uniformity of input material and often due to lacking experience of the producers (Kammen and Lew, 2005). Kiln performance directly affects environmental conditions, as the choice of the technology and the knowledge of the producer regulates the amount and the composition of trees used (Figure 1B). However, directly at the kiln site, remaining charcoal particles might improve soil fertility and water holding capacity and therefore food production (“Terra Preta”) (Barrow, 2012). In an optimized system, knowledge on improved production techniques could be disseminated and respective training measures could be applied. Improved charcoal production processes can reach carbonization rates of up to 30% (Iiyama et al., 2014), thereby minimizing energy losses. The latter will most likely contribute positively toward woody resources, biodiversity conservation and climate change (Figure 1B). Furthermore, leftover particles might be used more effectively for soil improvement when e.g., being spread on farms. Productivity and subsequent income opportunities for charcoal producers would also increase, thereby decreasing food insecurity, especially during times of poor harvests (Figure 1A). Distribution of charcoal in the current system is mainly organized by the most influential group of wholesalers and vehicle transporters (Sander et al., 2013), who receive the majority of profits (Mwampamba et al., 2013). A smaller quantity of transport is also realized via bicycles. In Malawi, for example, 13% of the 92,000 people involved in the charcoal business are bicycle transporters (Kambewa et al., 2007). Thus, this transportation pathway is a factor for livelihood and food security, at least in semi-urban areas. Looking at the environmental effects of distribution (Figure 1B), current transportation relies mainly on trucks driven by fossil fuels, but Gmünder et al. (2014) report that, “transportation plays a small role in charcoal's climate impact” (p. 82). Thus, the environmental optimization potential of the transportation sector is rather limited. Data on the labor effects and working conditions of individuals involved in charcoal distribution is absent. Legalized charcoal transport, wholesale and retail, however, may not alter material flows substantially, but it would generate tax revenues that could be used to support social services, including food security programs (Figure 1A). Whether a change of the current status for wholesalers and retailers occurs depends on the strategy applied, operating official trading points seem promising. Charcoal is the major fuel in larger settlements: in East Africa, up to 90% of urban households rely on it (UNCCD, 2015), even though high levels of indoor air pollution (IAP) result (Dherani et al., 2008). Charcoal can be used in either traditional charcoal cooking stoves or in improved cooking stoves (ICS). The type of stove commonly used depends on a variety of factors, especially the (former) existence of stove dissemination programs (Ruiz-Mercado et al., 2011), including the cultural and social fitting of stove design (Bielecki and Wingenbach, 2014; Confino and Paddison, 2014), and the price of charcoal (Mobarak et al., 2012; Guta, 2014). Thus, adoption rates and rationales are highly site-specific and no conclusive overall analyses are available (Johnson and Bryden, 2012; Lewis and Pattanayak, 2012). An improved charcoal value chain must nevertheless include ICS, as their successful application most likely results in substantially reduced charcoal consumption. In particular, the emissions and fuel efficiency of stoves are important with regard to the environmental effects (Figure 1B). Combustion characteristics and efficiency rates differ due to differing stove designs (Maccarty et al., 2010). The potential of ICS to improve the efficiency of charcoal use is assessed differently but Kshirsagar and Kalamkar (2014) as well as Hutton et al. (2006) report fuel savings of 30–34% which might be accepted as close-to-real value. An improved value chain that simultaneously addresses sustainability challenges of the charcoal value chain related to water, energy, and food must necessarily include sustainable wood production, preferable in agroforestry systems. Harvesting procedures should be optimized by applying locally adapted harvesting techniques in adequate areas. The widespread utilization of improved charcoal kilns and ICS is likewise important for long-term success. 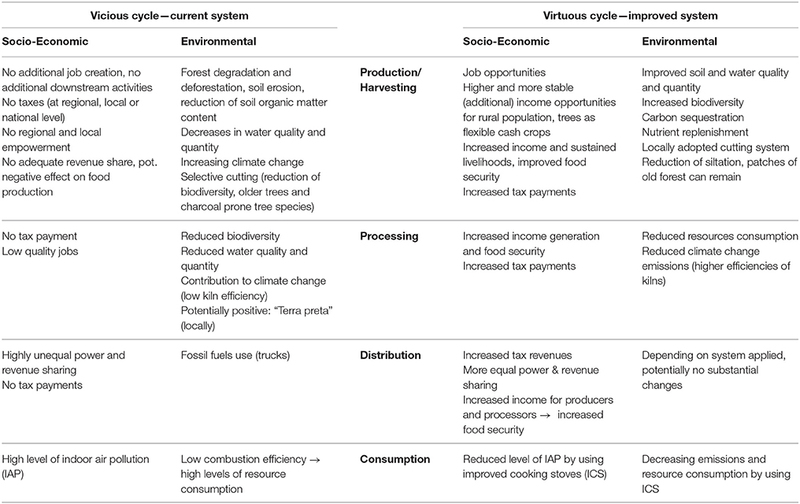 Improvements to the value chain should also include reliable and balanced taxation systems as this is likely to harmonize minimal ecological impacts with specific stakeholder needs (Figure 1A). In order to ensure that higher incentives do not lead to unsustainable harvests, harvesting rates must be regulated depending on local conditions. Additionally, patches of old forest should be conserved to foster soil protection and natural regrowth of particularly vulnerable or precious pieces of land (Hoffmann et al., 2016). Water, energy, and food related implications of vicious and virtuous production cycles as well as biodiversity and climate issues are summarized in Table 1. Table 1. Summary of water, energy and food related implications of vicious and virtuous production cycles, separated by value chain segments. The wood-energy sector is politically neglected in SSA (Doggart and Meshack, 2017) though it is huge and projected to increase. Thus, pressures on natural resources will increase too, even if the extent of its contribution to overall resource degradation is debated. We have collected arguments and evidence that charcoal value chains can be organized in a sustainable and inclusive way. To truly enhance the sustainable development of this sector, it must move up the political agenda. Both science and policy must acknowledge its environmental, social, and economic importance and its status as the most important renewable energy source in SSA for now and for decades to come. The establishment of sustainable charcoal value chains is essential for limiting environmental degradation that might occur. Research approaches and development strategies that truly integrate and harmonize all sectors and scales throughout the charcoal value chain simultaneously should be prioritized as the respective sectoral and scale interdependencies remain excluded from governmental strategies so far. We show that the WEF nexus approach offers a promising toolbox to do so: it can function as an intellectual bridge to overcome the separation of scales, sectors, and political spheres along the charcoal value chain, thus helping to improve its understanding and sustainable management. Recent international developments and initiatives invite to such a multi-dimensional approach: The Agenda 2030 requests to have integrate views on its sustainable development goals (SDGs) of which many can be directly linked to the charcoal value chain as we have shown: poverty (SDG 1), food security (SDG 2), health (SDG 3), energy (SDG 7), decent work (SDG 8), industry and innovation (SDG 9), sustainable cities (SDG 11), responsible consumption and production (SDG 12), climate action (SDG 13), life on land (SDG 15), and partnerships (SDG 17) (United Nations, 2015). There are new efforts to link the three Rio environmental conventions on biodiversity, climate change, and desertification and produce joint environmental and social co-benefits. New public and private funds are set up to finance sustainable energy and development projects and usually have to show (more or less stringent) multi-dimensional positive impacts and due diligence for negative ones (DIE/GDI, 2017). While all these new initiatives promise to support exactly the type of development-friendly charcoal production we have shown to be possible, charcoal value chains have not been studied within the context of WEF nexus approaches and concepts so far. Currently, WEF nexus projects mainly focus on urban areas and middle-income classes in rising (Asian) developing countries (Spiegelberg et al., 2015) while the overall challenges associated with sustainable bioenergy provision mainly occur in SSA. In line with this, Endo et al. (2017) report that <4% of actors involved in WEF nexus projects are African. Furthermore, current WEF nexus frameworks are largely applied from a water-centric perspective (Smajgl et al., 2016; Endo et al., 2017). However, the guiding principles of the WEF nexus approach, as outlined by Hoff (2011), entail very promising contact points with the charcoal sector in SSA: The implementation of sustainable wood production value chains represents a major contribution to sustaining ecosystem service (1st WEF nexus principle). Creating more with less (2nd WEF nexus principle) is mirrored in approaches to increase the efficiency of the existing charcoal production and consumption systems. As charcoal production is often the domain of socially marginalized groups (Khundi et al., 2011; Zulu and Richardson, 2013; Jones et al., 2016), efforts to allocate more financial resources to producers via implementation of inclusivity contribute toward integrating the poorest (3rd WEF nexus principle). In conclusion, the development of environmentally sound, socially inclusive and economically charcoal value chains—an old, large and unsolved challenge particularly in SSA—could gain new impetus in a new political setting which requests integrated multi-dimensional solutions. The WEF and extended environmental service approach can organize the evidence and arguments in a comprehensive way. This work was financially supported by the Program on Forests (PROFOR), by the country working group “Namibia” of the German Development Institute (DIE), and by the German Federal Ministry of Food and Agriculture (BMEL) based on the decision of the Parliament of the Federal Republic of Germany through the Federal Office for Agriculture and Food (BLE). It is embedded in the Scale-N project (http://www.scale-n.org/). Our special thanks goes to Sarah Schomers and Constance Rybak for their comments on wording and structure and to Clara Dewes and Daniela Wilden for their overall support. Beisheim, M. (2013). Der Nexus Wasser-Energie-Nahrung. Wie mit vernetzten Versorgungsrisiken umgehen? Berlin: Stiftung Wissenschaft und Politik. CAMCO (2014). Biomass Energy Strategy (best) Tanzania. Tanzania Biomass Energy Strategy and Action Plan. Final report. 138. Dar es Salaam: euei pdf - European Union Energy Initiative Partnership Dialogue Facility. Chamshama, S., Savadogo, P., and Marunda, C. (2010). “Plantations and Woodlots in Africa's Dry Forests and Woodlands,” in The Dry Forests and Woodlands in Africa. Managing for Products and Services, eds E. N. Chidumay, and D. J. Gumbo (London, Washington, DC: Earthscan), 205–230. Confino, J., and Paddison, L. (2014). Cookstove Designs are Failing the Poorest Communities. London, UK: Guardian News & Media Ltd. Available online at: http://www.theguardian.com/sustainable-business/cookstoves-design-poor-communities-refugees-unhcr-ikea (Accessed Sept 12, 2015). DIE/GDI (2017). Green Finance. Available online at: http://www.die-gdi.de/green-finance/ (Accessed Oct 02, 2017). FAO (2009). How to Feed the World in 2050. Rome: FAO- Food and Agriculture Organization of the United Nations. FAO (2014). The Water-Energy-Food-Nexus: A New Approach in Support of Food Security and Sustainable Agriculture. Rome: FAO- Food and Agriculture Organization of the United Nations. FAO (2015). Status of the World's Soil Resources. Rome: FAO- Food and Agriculture Organization of the United Nations. FAO (2017). The Charcoal Transition: Greening the Charcoal Value Chain to Mitigate Climate Change and Improve Local Livelihoods. Rome: FAO- Food and Agriculture Organization of the United Nations. Foresight (2011). The Future of Food and Farming. Final Project Report. London: The Government Office for Science. Gmünder, S., Zah, R., Rainhard, J., and Charron-Doucet, F. (2014). Transforming Tanzania's Charcoal Sector. Life Cycle Assessment Component, Zurich: Quantis Switzerland/Germany. Hanna, R., Duflo, E., and Greenstone, M. (2012). “Up in Smoke: The influence of household behavior on the long-run impact of improved cooking stoves,” in Working Paper Series (Cambridge, MA: MIT - Massachusetts Institute of Technology; Department of Economics), 12–10. Hoff, H. (2011). “Understanding the Nexus,” in Background Paper for the Bonn 2011 Conference: The Water, Energy and Food Security Nexus (Stockholm: SEI - Stockholm Environment Institute). Hoffmann, H., Brüntrup, M., and Sander, K. (2016). At the Wooden Cross-Road, in: Rural 21. Frankfurt: DLG-Verlag GmbH. Hutton, G., Rehfuess, E., Tediosi, F., and Weiss, S. (2006). Evaluation of the Costs and Benefits of Household Energy and Health Interventions at Global and Regional Level. Geneva: WHO - World Health Organization. IEA (2013). World Energy Outlook 2013. Paris: IEA- International Energy Agency. Kambewa, P., Mataya, B., Sichinga, K., and Johnson, T. (2007). Charcoal: the Reality. A Study of Charcoal Consumption, Trade and Production in Malawi, London, UK: IIED - International Institute for Environment and Development. Kammen, D. M., and Lew, D. J. (2005). Review of Technologies for the Production and Use of Charcoal: Renewable and Appropriate Energy Laboratory Report. Golden: National Renewable Energy Laboratory. Kwarteng, E. (2015). Fuelwood Value Chain Analysis Literature Review Report., The USAID/Ghana Sustainable Fisheries Management Project (SFMP). Narragansett, RI: Coastal Resources Center, Graduate School of Oceanography, University of Rhode Island and SNV Netherlands Development Organization. Mugo, F., and Ong, C. (2006). “Lessons from eastern Africa's unsustainable charcoal trade,” in ICRAF Working Paper (Nairobi: ICRAF - World Agroforestry Center. Neufeldt, H., Dobie, P., Iiyama, M., Njenga, M., Mohan, S., and Neely, C. (2015). Developing Sustainable Tree-Based Bioenergy Systems in Sub-Saharan Africa: ICRAF Policy Brief 28. Nairobi: ICRAF - World Agroforestry Centre. Peter, C., and Sander, K. (2009). Environmental Crisis or Sustainable Development Opportunity? Transforming the Charcoal Sector in Tanzania. A policy note. Washington, DC: The World Bank. UNCCD (2015). Fuel for Life. Securing the Land-Energy Nexus. Bonn, Germany: UNCCD-United Nations Convention to Combat Desertification. UNEP (2008). Vital Water Graphics. Nairobi: United Nations Environment Programme. United Nations (2015): Resolution adopted by the General Assembly on 25 September 2015 New York, NY: United Nations. World Economic Forum (2011). Water Security. The Water-Food-Energy-Climate Nexus, Washington, DC: World Economic Forum. WWF (2016). Living Planet Report 2016, Risk and Resilience in a New Era. Gland: WWF International. Copyright © 2017 Hoffmann, Sander, Brüntrup and Sieber. This is an open-access article distributed under the terms of the Creative Commons Attribution License (CC BY). The use, distribution or reproduction in other forums is permitted, provided the original author(s) or licensor are credited and that the original publication in this journal is cited, in accordance with accepted academic practice. No use, distribution or reproduction is permitted which does not comply with these terms.